We have been waiting for the Archos 5 for a long time now, tracking every little bit of detail that comes out about it. It’s a pity that Archos isn’t a big brand in India when it comes to portable multimedia players (PMPs), because it is by far one of the best ones out there. 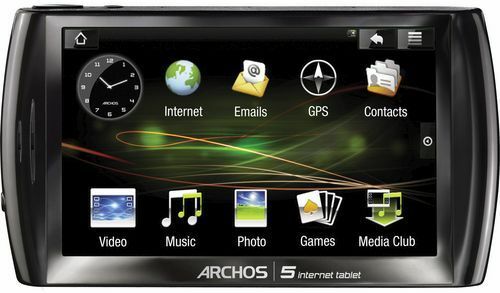 The Archos 5 Internet tablet is set to be the first non-phone Android device, doubling up as a PMP. And now, the first official-looking shots (check the gallery below) have leaked along with prices. The gadget is set to release on September 15, with approximate prices slated as Rs 14,500 ($294) for 16GB SSD, Rs 18,200 ($370) for 32GB SSD, Rs 15,700 ($320) for 160GB HDD, and Rs 20,600 ($420) for a 500GB HDD. RIM's new media-streaming device - the BlackBerry Cyclone? 1. Although the 800 x 480 4.8-inch touchscreen is laudably bright and clear, it's still a resistive touch panel and feels like one, depressing slightly with each press and reacting a bit slowly in general. 2. The Opera-powered browser rendered fine, although it scrolled a bit choppily, and the mail client was functional, but obviously not capable enough to be used day-to-day -- it can't delete IMAP emails, for example. 3. We also tried out the DVR station accessory, and while it upscaled the interface and content to 720p admirably, we were unable to get it to recognize component video in from a TiVo HD. Summing up, Engadget said the Archos 5 has great potential, but still needs a lot of work to polish it up. We, on the other hand, are just giddy to see a non-phone Android device finally seeing the light of day. Who knows, Google Chrome OS might lead to similar things for non-netbook computers! If we root android device is the warrenty of phone gets cancaled by company?